Earlier, while watching KrisTV, I had the incredible craving for champorado. Good thing Berto and I remembered to pick up a White King Cham-O-Rado pack when we went to the grocery last week. All the food I see in Kris Aquino's show just makes me hungry! The box contains 2 individual packets that's good for 5 servings. We used both packets so that it's good for 10 servings. 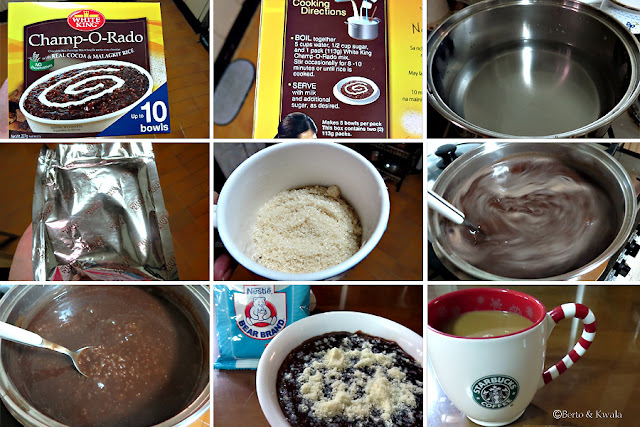 Boil together 10 cups of water, 1 cup of sugar and 2 packets of the champorado mix. Stir occasionally to make sure the rice doesn't stick to the bottom of the pot. Cook for 8-10 minutes or until the rice is cooked. Serve with milk on top. I love how this recipe is so easy to follow, because everything is instant! Perfect for someone like me. (I hate being in the kitchen). Berto and I prefer powdered milk on our champorado. It makes it more creamy. Berto prefers Nestle Bear Brand, and I just let him have his fun. =) That was my breakfast earlier, a bowl of champorado paired with a big mug of coffee. I cooked so much champorado Berto and I had 2 servings each in the morning and we also had this for snack in the afternoon. Bea loves it too!